This Chocolate Coconut Cake is super fluffy, supremely chocolatey, and speckled with shredded coconut throughout. It seriously doesn’t taste like it’s low in sugar, high in protein, or gluten free whatsoever! This Healthy Chocolate Coconut Cake was a looooong time coming. I first posted this recipe WAY back in 2011. Yes, 2011! Even then, it took 4 trials to perfect. 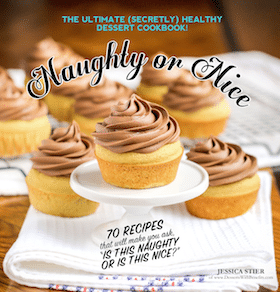 While I proudly posted the recipe and kept it up all these years, there was always something nagging me about it — it called for way too many ingredients and required far too many steps to make. I went back to the drawing board to try and make it simpler and easier for y’all. And boy, am I glad I did. I thought the cake was good back then, but now it’s GREAT. Yeah. I altered the recipe quite a bit, but it’s all for the better. Let’s go through the trial results, shall we? This cake was far too airy and dry. It’s hard to explain, but it was like a slice of bread that was left out overnight. The texture was terrible and it tasted really bitter. Due to my fervent need to lower the sugar levels in all of the recipes I make, I lowered this one a little too much. The original recipe called for a whopping 1½ cups of sugar, which I reduced to a measly ¼ cup of Sucanat. I knew beforehand that I lowered the sugar level by a lot, so I added ¼ tsp of stevia extract, which was clearly not enough. I replaced the regular cocoa powder with dark cocoa powder, used whole wheat pastry flour instead of bleached all purpose flour, and coconut oil + applesauce instead of butter. I used canned coconut milk in the recipe but it didn’t seem to provide any flavor or moisture. After sampling that slice of cake, I was so ready for the next trial. Since the 1st trial was too airy and dry, I researched some healthy ingredients that can add moisture to baked goods. Tofu was one of them. I blended up 85g silken tofu and added that to the recipe. I also doubled the stevia extract from ¼ tsp to ½ tsp, and added a ½ tsp of coconut extract to enhance the coconut flavor (or, lack-thereof from the 1st trial). This cake was still a little on the dry side, but was at least a tad bit sweeter and more flavorful! It was better, but still not something I’d be proud of serving to friends and family. I increased both the stevia extract and coconut extract to ¾ tsp, as well as the tofu to 170g. My dad wanted a treat with some protein in it, so I replaced some of the whole wheat pastry flour with protein powder. Once again, the cake turned out dry, but the flavor was improving! Mmmm! Finally, a cake that I can share with loved ones with my head held high! This cake is much, much better than the previous trials — more dense, more moist, more sweet, and more chocolatey! In an attempt to make Trial #4’s recipe a little easier to make with fewer ingredients and less steps (and also make it gluten-free because I was out of whole wheat pastry flour), I replaced the 1¼ cups whole wheat pastry flour with ¾ cup sweet white sorghum flour + ½ cup oat flour. I replaced the tofu with an egg, omitted the honey and increased the stevia extract to 2 tsp, used erythritol instead of sucanat, increased the vanilla extract from 1 tsp to 2 tsp. I used the same brand of coconut extract in this trial as I did way back in 2011 in the 4th trial, however, it seems as if they changed their product’s recipe because it did NOT taste anything like coconut. It tasted like straight up coconut alcohol. My first taste tester thought it was a boozy cake, that’s how strong it was. The cake also turned out dry. Back to the drawing board, once again! 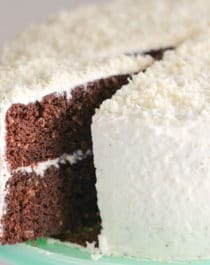 This Chocolate Coconut Cake is super fluffy, supremely chocolatey, and speckled with shredded coconut throughout. It seriously doesn't taste like it's low in sugar, high in protein, or gluten free whatsoever! Preheat the oven to 350 degrees Fahrenheit. Spray two 8" cake pans with cooking spray and line with parchment paper circles. In a small bowl, whisk together the sorghum flour, protein powder, oat flour, shredded coconut, baking soda, baking powder, and salt. In a stand mixer bowl with whisk attachment, add the milk, applesauce, erythritol, eggs, vanilla extract, and stevia extract. Mix on low speed. In a medium-sized bowl, stir together the chocolate and melted coconut oil. Add the boiled water and cocoa powder and whisk until smooth (it should look like ganache). With the mixer running on low speed, slowly scoop this mixture into the mixer. 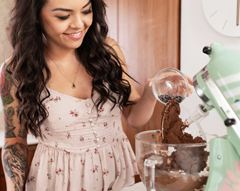 Dump the dry ingredients in the stand mixer and let mix until just mixed through. Scrape down the sides of the bowl and mix one last time. Pour batter evenly into the prepared pans and bake for ~30 minutes, or until the surface of the cakes spring back when tapped. Let cool completely, then frost and serve! I frosted my cake with the Cream Cheese Frosting recipe from my Naughty or Nice Cookbook and added ~1 cup or so of shredded coconut to it. I just eyeballed it. Another good frosting option would be Miss Jones Organic Vanilla or Cream Cheese Frosting! This label is for realz peeps. Only 260 calories and 7g of sugar, plus 5g of fiber and 10g of protein. In a CAKE. 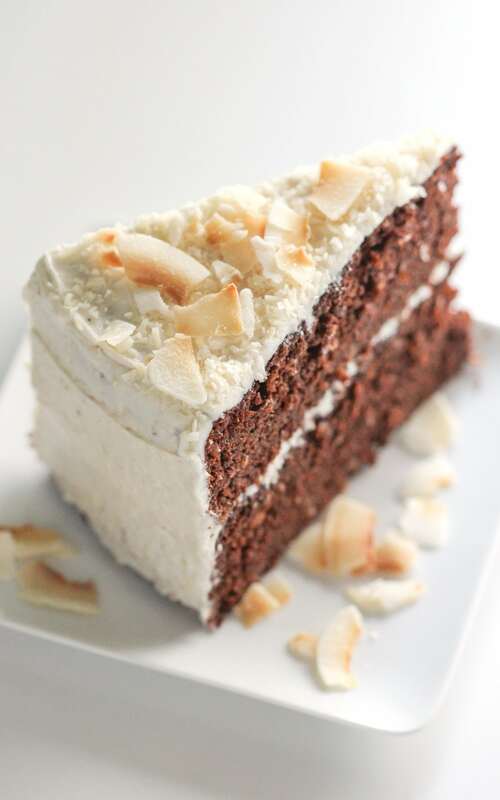 As a comparison, the same serving size of a typical Chocolate Coconut Cake (without frosting) will have around 400+ calories, 16g fat, and 26+g sugar. Um, no thank you. 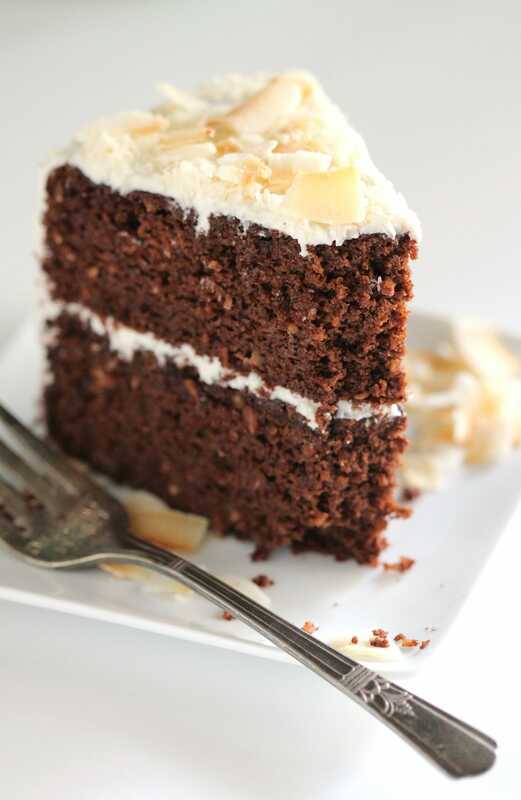 We can indulge in this Healthy Chocolate Coconut Cake instead. Would you believe me if I told you this is healthy enough for breakfast? Oh yes, I’m serious. It’s got protein powder, like a breakfast smoothie! It’s got applesauce and coconut, so you’re getting in some fruit. It’s got chocolate, so, you know, antioxidants! The list goes on, but I’ll cut it short there… I guess what I’m trying to say is, you just can’t miss out on this chocolatey goodness! Hi Jessica! This cake sounds awesome, I’ll have to give it a try. ^_^ You can probably add more coconut oil to it or add an extra egg to make it more dense. Seriously, this is my new favorite blog! Maybe if you baked it in a muffin tin and renamed it a breakfast food, the airiness would seem appropriate and wouldn’t bother you. Either way, it does look delicious! Thanks for sharing. Wow, you put so much effort into finding the best recipe, that is awesome! This cake looks amazingly beautiful, it’s hard to believe it’s got such an awesome ingredients list. Looks delicious! Even if it is a bit airy for your tastes, it looks like a winner! Yeah, next time I’ll bake it in a muffin tin and maybe add a flax egg… thanks for helping R.C. and Carissa! Um, drool? I want it! Justr a general question… when you substitute in whole wheat flour instead of all-purpose, do you need to add more liquids? For some reason I feel like whole wheat flour would absorb the liquids more. Don’t despair! A brilliant recipe takes plenty of trial and error. That is, unless if you can see the future. (: I think the cake looks good enough! When you use whole wheat flour instead of AP flour, the end product is more dense, dryer and harder–that’s why certain recipes ask for sifting–you may need to add more oil or applesauce to achieve the moisture level you want, but only by a tbs or two, depending on the recipe. Hope that helps! I know! Don’t you just hate the crash you get after eating a lot of sugar? I’m glad I’m not alone haha. Yum! We’d love for you to share this over at dishfolio.com! 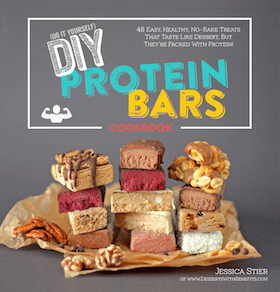 jessica, this looks amazing! i want cake for breakfast!!!!! Ahhh, it looks so good. I can’t wait to bake everything on you blog over winter break once the semester ends. …Which reminds me, would you ever post how to make a healthy gingerbread (for say, a gingerbread house)? I’m all for having cake for breakfast, if said cake is healthy and good for me. This one surely qualifies! It’s gorgeous and looks absolutely scrumptious. I think I won’t have a choice but give this one a go, else I’ll obsess over it for the rest of my days!? Is the whey protein concentrate really needed or could I leave it out? I also like the general idea of your blog – which I just discovered by the way – so I will definitely follow and try out some of your recipes! Looks really good! I always love to try different kinds of chocolate cakes and this one never disappoints me. Jessica this is the HEALTHIEST chocolate cake I have ever tricked normal people with! No one suspected that this cake was ANYTHING but rich and decadent. Thank you thank you! Now call me crazy, but I’d have this cake for breakfast! Thank you for sharing your trials and experiments with this cake recipe. I bet that this tastes wonderful! Do you have any vegan substitutions for the whey protein and eggs? The whey protein and eggs are crucial ingredients here as they help with texture and overall lift. Any substitution for the applesauce? You can use another fruit puree in place of the applesauce, like pear sauce. I think pure pumpkin puree MIGHT work, but you’ll probably need to use 1 cup since pumpkin puree contains less water than applesauce. I hate to be the one to break it to you, this isn’t cake !!! !